(Newser) – Johnny Depp has responded to uproar over his joke about assassinating the president. "I apologize for the bad joke I attempted last night in poor taste about President Trump," he says in a statement to People. "It did not come out as intended, and I intended no malice. I was only trying to amuse, not to harm anyone." 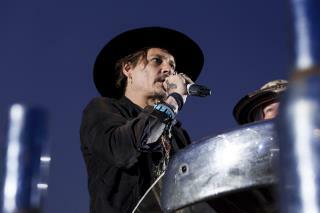 Depp was introducing a screening of his 2004 film The Libertine at England's Glastonbury Festival Thursday when he mused, among other things, "When was the last time an actor assassinated a president?" Like Madonna and Streep, I was once a fan of Depp, I have no use for any of these people anymore. These Hollywood dopes have lost their minds. Just put Johnny Depp on the no fly list so he can't come back.